The latest addition to our LvlUp suite of products, BidAmp is a Header Bidding and Mediation solution that represents the most effective substitute to the traditional Publisher Waterfall model. BidAmp’s Header Bidding solution parallely broadcasts ad-request to multiple demand sources before DFP call. The highest bid obtained as a result is then pushed in DFP to allow multiple exchanges/demand partners to compete against DFP line items, Google AdX and direct campaigns. BidAmp’s Dynamic Mediation solution subsitutes the traditional waterfall model at an ad-server level. 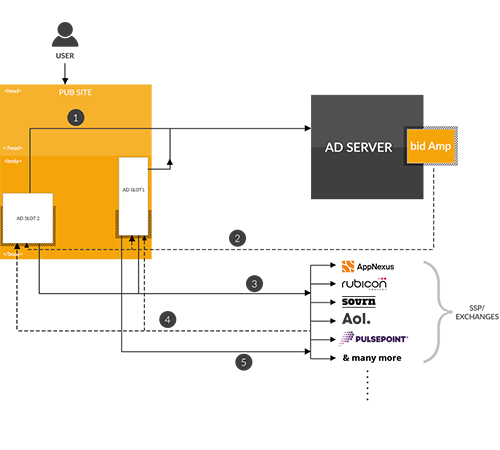 After the ad-server recieves an ad-request, BidAmp’s dymanic mediation solution broadcasts this request to the programmatic demand sources in parallel. As against an exchange-driven mediation solution, BidAmp is a completely neutral arbiter of demand. There is no conflict of interest, and you can be absolutely sure that the best exchange wins the bid. May the best bid win! Does BidAmp introduce latency ? Timeout limit can be set in BidAmp to cap the latency. BidAmp asynchronously sends ad requests to ensure that no latency is introduced in loading the site content. What is BidAmp's price point ? 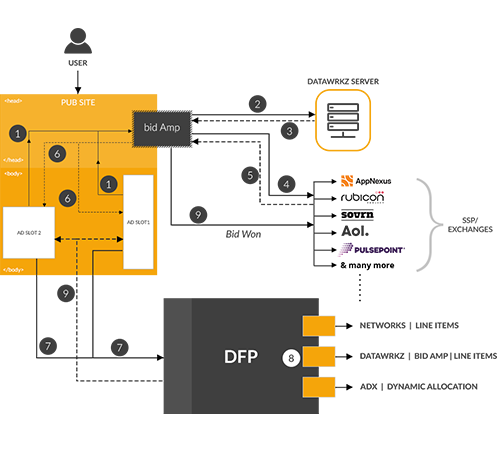 BidAmp has a lucrative price point and is Publisher-friendly. How is BidAmp integrated with publisher exchanges ? BidAmp can be configured to send bid request on any of the exchanges already integrated or any additional exchange that provides a prebid adaptor. How can BidAmp be integrated with Datawrkz exchange ? BidAmp clients can leverage Datawrkz-Exchange relationships to expand the pool of demand they can access.